Questions 4 and 5. 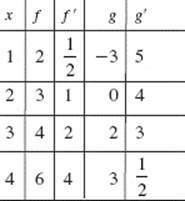 Use the following table, which shows the values of the differentiable functions f and g.
f ′(x) = x2(x + 1)3(x − 4)2. 9. 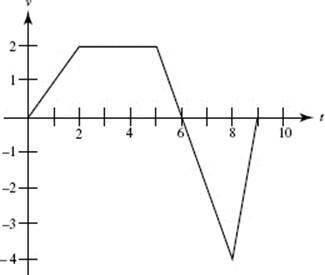 Which equation has the slope field shown below? 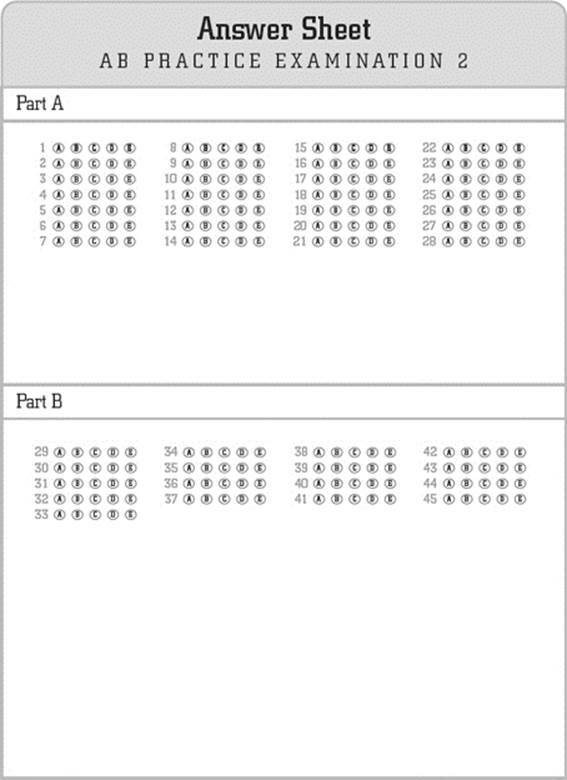 Questions 10–12. The graph below shows the velocity of an object moving along a line, for 0 ≤ t ≤ 9. 10. At what time does the object attain its maximum acceleration? (E) None of these is true. 19. 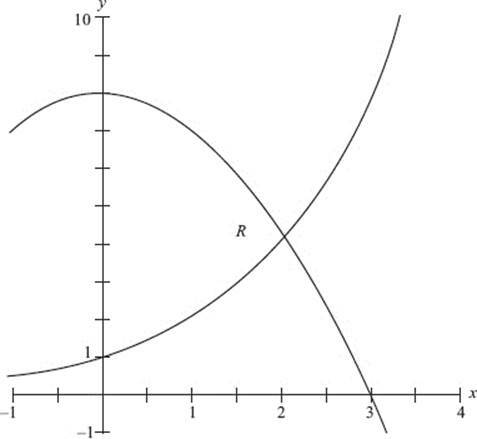 The equation of the curve shown below is What does the area of the shaded region equal? (D) does not exist, because f is not continuous. (E) does not exist, because f is not integrable. 24. At what value of h is the rate of increase of twice the rate of increase of h ? 25. 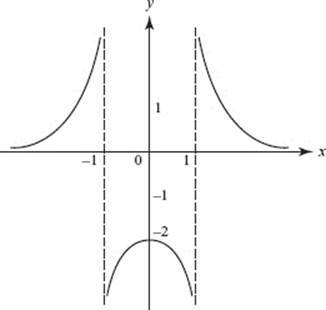 The graph of a function y = f (x) is shown above. Which is true? 29. Let G(x) = [f (x)]2. At x = a, the graph of f is increasing and concave downward, while G is decreasing. 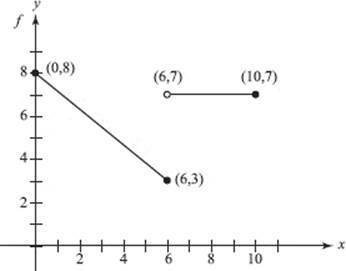 Which describes the graph of G at x = a ? 32. The graph of f ′, which consists of a quarter-circle and two line segments, is shown above. At x = 2, which of the following statements is true? (A) f is not continuous. (B) f is continuous but not differentiable. (C) f has a relative maximum. (D) The graph of f has a point of inflection. 33. Let where f is the function whose graph appears below. 34. The table shows the speed of an object, in feet per second, at various times during a 12-second interval. Estimate the distance the object travels, using the midpoint method with 3 subintervals. 35. In a marathon, when the winner crosses the finish line many runners are still on the course, some quite far behind. If the density of runners x miles from the finish line is given by R(x) = 20[1 − cos(1 + 0.03x2)] runners per mile, how many are within 8 miles of the finish line? 36. 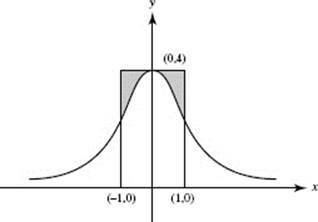 Which best describes the behavior of the function at x = 1? (A) It has a jump discontinuity. (B) It has an infinite discontinuity. (C) It has a removable discontinuity. (D) It is both continuous and differentiable. (E) It is continuous but not differentiable. 39. 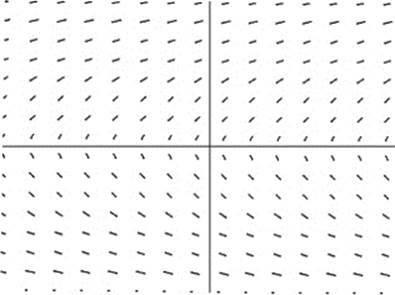 The region S in the figure shown above is bounded by y = sec x and y = 4. 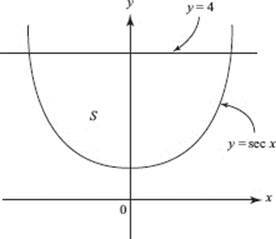 What is the volume of the solid formed when S is rotated about the x-axis? 40. At which point on the graph of y = f (x) shown above is f ′(x) < 0 and f ″(x) > 0? 41. Let f (x) = x5 + 1, and let g be the inverse function of f. What is the value of g ′(0)? (D) g ′(0) does not exist. (E) g ′(0) cannot be determined from the given information. 43. At how many points on the interval [0,π] does f (x) = 2 sin x + sin 4x satisfy the Mean Value Theorem? 45. The rate at which a purification process can remove contaminants from a tank of water is proportional to the amount of contaminant remaining. If 20% of the contaminant can be removed during the first minute of the process and 98% must be removed to make the water safe, approximately how long will the decontamination process take? 1. A function f is defined on the interval [0,4], and its derivative is f ′(x) = esin x − 2 cos 3x. (a) Sketch f ′ in the window [0,4] × [−2,5]. (b) On what interval is f increasing? Justify your answer. (c) At what value(s) of x does f have local maxima? Justify your answer. 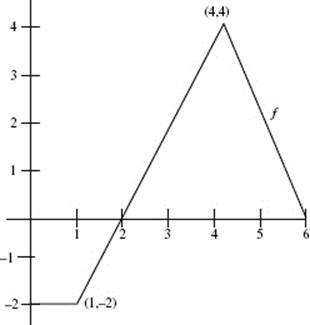 (d) How many points of inflection does the graph of f have? Justify your answer. (a) Using a trapezoidal approximation, estimate the number of units the company sold during the second quarter (April 1, 2012, through June 30, 2012). (b) After looking at these sales figures, a manager suggests that the rate of sales can be modeled by assuming the rate to be initially 120 units/month and to double every 3 months. Write an equation for S based on this model. (c) Compare the model’s prediction for total second quarter sales with your estimate from part a. (d) Use the model to predict the average value of S(t) for the entire first year. Explain what your answer means. (a) Write an equation of the line tangent to f at (2, 5). (b) Using this tangent line, estimate f (2.1). (c) Solve the differential equation, expressing f as a function of x. (d) Using your answer to part (c), find f (2.1). 4. Let R represent the first-quadrant region bounded by the y-axis and the curves y = 2x and as shown in the graph. (a) Find the area of region R.
(ii) the volume of the solid whose base is R, if all cross sections in planes perpendicular to the x-axis are squares. (a) For what values of x is f decreasing? 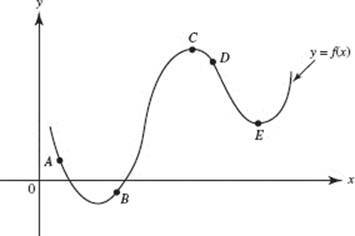 (b) Does this decreasing arc reach a local or a global minimum? Justify your answer. (c) Does f have a global maximum? Justify your answer. 6. (a) A spherical snowball melts so that its surface area shrinks at the constant rate of 10 square centimeters per minute. What is the rate of change of volume when the snowball is 12 centimeters in diameter? (b) The snowball is packed most densely nearest the center. Suppose that, when it is 12 centimeters in diameter, its density x centimeters from the center is given by grams per cubic centimeter. Set up an integral for the total number of grams (mass) of the snowball then. Do not evaluate.